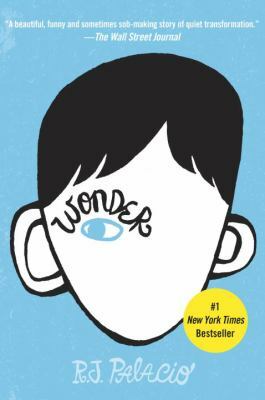 Posted on January 23, 2019 by Sophia D.
I’m sure you’ve all heard of Wonder, by R.J. Palacio. It’s a good book that bring to light bullying in middle school. 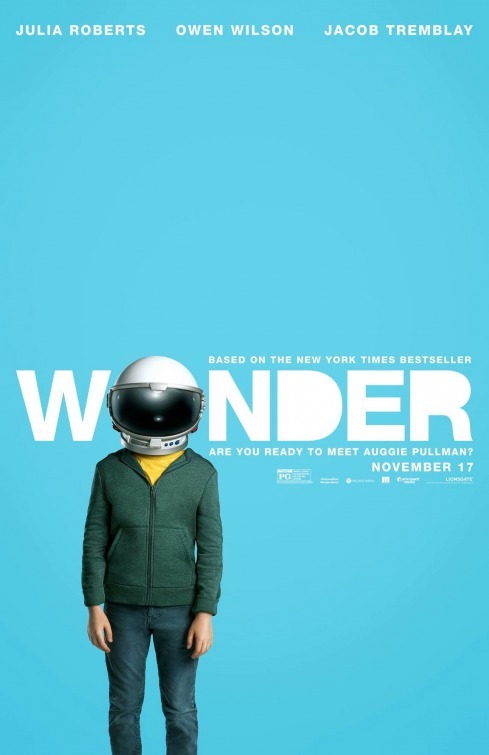 Wonder is about a boy named Auggie Pullman. He’s been homeschooled all his life, and now his mother has decided to put him into public middle school. Of course, we know that middle school can be cruel. For Auggie, it’s a bit more than normal bullying. Auggie was born with a facial deformity. Throughout his life, he struggled to accept this, often wearing an astronaut helmet when he went out in public. As expected, Auggie is bullied in his new school. He has one good friend who tends to stick by him. Just like in real life, and perhaps more for Auggie, he goes through ups and downs with his family and friends. The book is very good, and shows how a family must always be there for each other. Auggie’s family is there for him throughout the book. It also shows that friends can be there to help too. Now, the movie. I actually did not like the movie, I’m sad to say. Though I loved the book, I felt like Auggie was a jerk to his family, especially his mom. His mom is always so supportive of him and just wants the best for him. I just felt like Auggie acted like a brat who thought he could get whatever he wanted. This makes me sad, because Auggie is not like that in the book (in my opinion). My interpretation of book Auggie was that, yes, he had his difficulties in school. And sure, he might of argued with his mom. But I think that it was the heat of the moment, and he always apologized in the end. With movie Auggie, I felt like he yelled and screamed at his mom when he didn’t get his way. Then, he would run to his room and slam the door. When his mom came to comfort him, he would yell at her more, even though she was trying to make him feel better. And when he apologized, it sounded insincere. In summary, I enjoyed the book, but thought that the movie was not enjoyable. Wonder, both the book and film, by R. J. Palacio is available for checkout from the Mission Viejo Library. Wonder is a book about Auggie Pullman. Auggie was born with Treacher Collins Syndrome which affects bone development. Because of this, Auggie is always the odd one out. On his first day at Beecher Prep, Auggie’s new middle school he gets a tour of the school with Jack, Julian, and some other kids. Straight away Julian is rude and mean towards Auggie, but Jack is nice. As the year progresses, the students get used to how he looks and befriend Auggie. But shortly after a rumor spreads that touching Auggie will give you the plague. This makes the kids avoid Auggie once again. Then Halloween, Auggie’s favorite holiday, comes around. Auggie decides to dress up as Bloody Scream. As he’s walking into class, he hears Jack say that if he looked like Auggie he would kill himself. Jack had no idea that Auggie heard him. Auggie stops talking to Jack, and so Jack asks Auggie’s new best friend Summer why he’s mad. Summer response is Bloody Scream. Soon Jack realizes that he had seen Auggie in a Bloody Scream costume standing at the door to the class. Jack immediately regrets what he said and apologizes to Auggie. Then one day Julian tells Jack that being friends with Auggie isn’t worth it. This makes Jack angry and so he punches Julian in the face. Because of that incident, after winter break Julian turns all the boys in their grade against Jack and Auggie, launching some kind of war. After a while however, kids get tired of their little war and become friends with Auggie. The book ends at a three day nature retreat. One day at night Jack and Auggie go into the woods because Jack has to pee. While in the woods, Auggie and Jack run into kids from a different school. The kids make fun of Auggie until three kids from Beecher Prep that normally also make fun of Auggie stand up for him. Then later on back at the school Auggie wins an award for courage and kindness. Everyone wants to be Auggie’s friend now and he’s no longer the odd one out. Wonder by R.J Palacio is available for checkout at the Mission Viejo Libary. Posted on October 26, 2016 by Diana P.
I recently finished the novel Wonder by R. J. Palacio. I had seen good reviews about this book and its ability to connect with readers from a wide age group. After reading the story for myself, I found a novel that was personable and heartfelt, teeming with life lessons. The book is about a 5th grader named August Pullman who was born with a facial deformity. It’s told from the perspective of various characters in the story, explaining how their lives are affected by August. August has been homeschooled his entire life, up until the 5th grade, when his mom urges him to attend a local elementary school. Apprehensively, August complies, and is hit with the expected reactions: stares, whispers, and giggles from his fellow classmates. Naturally, I began to develop a dislike for those characters who hurt August, and excluded him just because he looked different. I’d often ask myself how characters could be so cruel, how strangers could openly gawk at him with no shame. Unfortunately, the answer was simple; people are curious and often afraid of what’s different. This novel really makes the reader inquire on what it means to be different. August dawns the same playful and curious personality of a 5th grader, just with an alternative appearance. One of my favorite quotes from the novel was “The only reason I’m not ordinary is because no one else sees me that way.” This line captures the essence of the entire story, reminding the reader that normality is simply an idea in one’s head. Differences are a thing to be celebrated; they make the world a colorful, interesting place. However, problems arose when characters in Wonder couldn’t just see August as a human being, similar to themselves. Flowers come in a multitude of colors, lengths, and locations, but they’re still flowers. August’s face does not fit the typical standard, but it doesn’t make him less of a person. August Pullman is different; one look and anyone could see. Nonetheless, at the end of the novel, students and parents came to realize that August Pullman is not lost cause, a sad story. Just because he dawns his differences on his face, it doesn’t make him any more unusual than the next person. I recommend this novel to anyone and everyone; it’s a well-written reminder that variety really is the spice of life. Wonder is available for checkout from the Mission Viejo Library. It is also available for download on Overdrive.